44 W INTER 2019 PracticeLink.com features in the practice because everyone wants to feel that when you're going to work, you're making the place better," Deshur explains. He adds that phrasing a suggestion as a question is a good way to persuade others without putting peers and senior colleagues on the defensive. "For example, you could say, 'Do you think if we tried X, it might be an improvement?'" At practices that welcome this type of input, younger physicians get to develop their leadership potential and prepare for formal management responsibilities down the road, Deshur says. He recommends assessing prospective employers by asking recently hired doctors if they've been allowed and encouraged to suggest changes. Managing upward can be especially challenging in the medical world. Physician training favors on-the-spot decision-making, and this tends to develop reactive management skills rather than proactive ones. As a result, some supervisors only communicate with their subordinates when there's a problem, which can be discouraging for young physicians who want to do well. Scheduling a regular check-in with your boss can help you confirm you're on track. Mentors provide invaluable guidance If you nurture relationships with your boss and other experienced physicians, you may find they become long- term mentors. These mentors can be invaluable as you navigate key career decisions. "I've been very fortunate to have several mentors I've leaned heavily on," Deshur says. "Even though my career trajectory was different than theirs, they helped me take a step back and think about what my strengths and weaknesses are and what am I interested in." Deshur didn't have to look far for his mentors. He found them in his direct managers. "I was lucky that I had them right in front of me," he says. "But if you don't have mentors readily available, seeking out one or two people who can give you feedback and advice is so important. So many people have tremendous experience to share that you can learn from." Finding mentors may require effort and creativity, but one easy way to start is to keep in touch with older physicians you admired during your training. If your job takes you to a different part of the country, ask them to introduce you to respected colleagues in the area. Joining your local medical society can also help you form relationships with physicians from a range of specialties, especially since society leaders are often Considering an MB a ? Options for physicians abound WHEN CHANDLER L AUNCHED THE MD/ MBA PROGR AM AT UNIVERSIT Y OF CALIFORNIA, IRVINE IN THE L ATE 90'S, just a handful of universities offered this dual-degree option. Today, there are more than 60 universities in the u .S. and abroad that allow students to pursue an M.D. and an MBA in one program. A dual-degree program like the one at u CI is a great way to develop management skills from the start of your medical career. 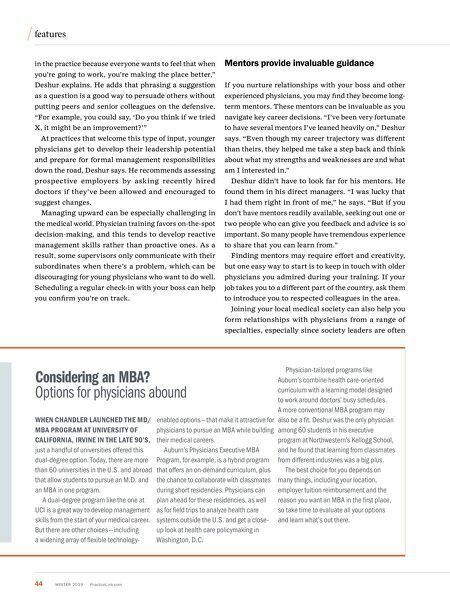 But there are other choices — including a widening array of flexible technology- enabled options — that make it attractive for physicians to pursue an MBA while building their medical careers. Auburn's Physicians Executive MBA Program, for example, is a hybrid program that offers an on-demand curriculum, plus the chance to collaborate with classmates during short residencies. Physicians can plan ahead for these residencies, as well as for field trips to analyze health care systems outside the u .S. and get a close- up look at health care policymaking in Washington, D.C. Physician-tailored programs like Auburn's combine health care-oriented curriculum with a learning model designed to work around doctors' busy schedules. 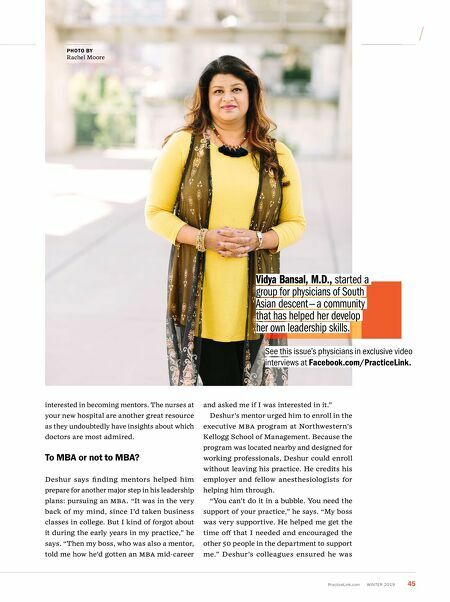 A more conventional MBA program may also be a fit. Deshur was the only physician among 60 students in his executive program at Northwestern's Kellogg School, and he found that learning from classmates from different industries was a big plus. The best choice for you depends on many things, including your location, employer tuition reimbursement and the reason you want an MBA in the first place, so take time to evaluate all your options and learn what's out there.